My first summer project was inspired by a picture from Pinterest. I was working on a big round yoke cardigan (later gifted to a friend) and couldn’t help but notice that its construction was truly close to the one on the photo. Usually it is rather hard to explain why you are attracted to some things because among many reasons one of the most decisive and least tangible is the context in which you first come across them. In this particular case I believe it was a combination of color work and round yoke construction. 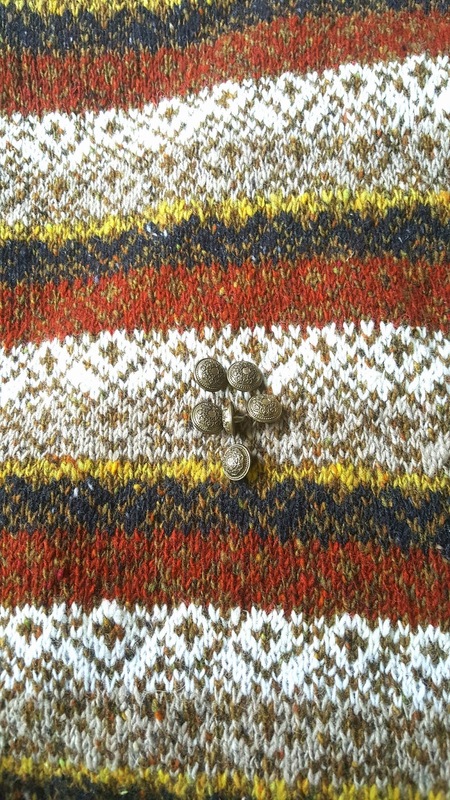 I love black-gray-white combination in fairisle motifs and knitting round yokes (from top or bottom) turned out to be exciting in many ways (at least for me, as you can see from my last projects). Anyway, I couldn’t stop getting back to this jacket trying to find a better photo with more details. Soon it was pretty clear what I wanted to make next. I don’t design my clothes often. Normally, I take a design that I like and either just follow directions or modify them in order to get a better fit. This time I had only a picture, so I decided to be cautious and use some old recycled yarn. If my end result wasn’t successful, at least I wouldn’t have used anything expensive. And if it was, I could make the same project again later from a better yarn. 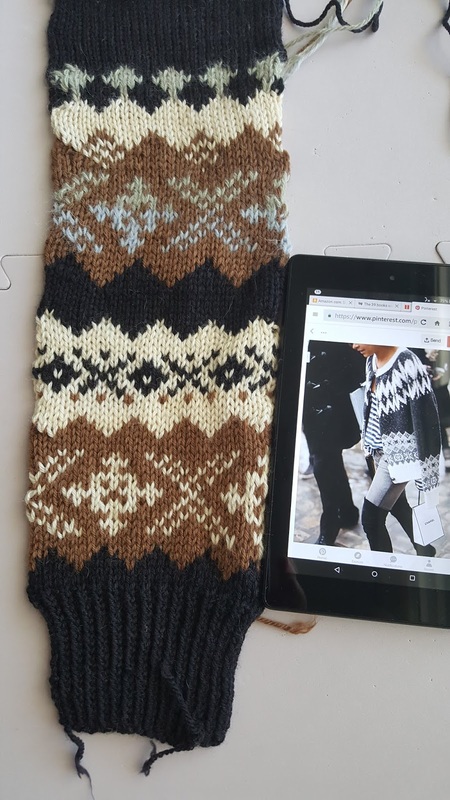 Even though it required a total concentration and lots of math, or maybe because of it, I absolutely loved working on my Miroslava Duma’s cardigan “knock-off” which is why it was finished in no time. All the details are on my Ravelry page. I don’t remember the size of needles – I think it was 3.5 mm (US 4) and 4.00 mm (US 6). 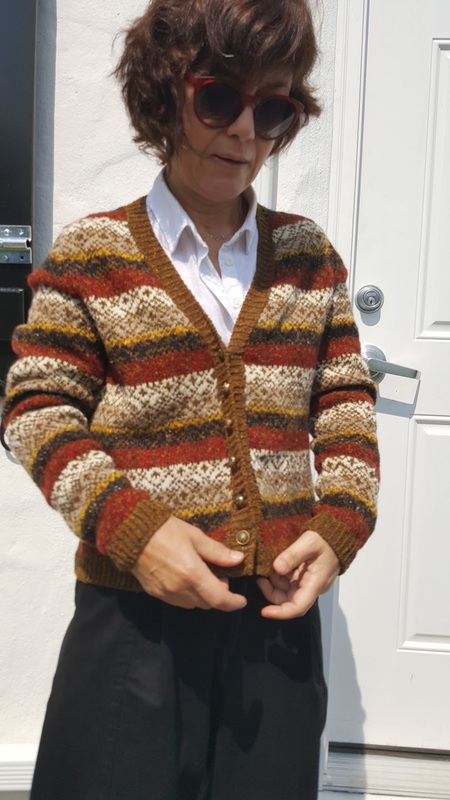 I used Norah Gaughan’s old pattern from Vogue Knitting 1999 as a starting point for the cardigan’s construction and some color work motifs from Pinterest and another Norah’s old pattern. My variation of this cardigan turned out almost the way I wanted it. Next time I plan to make its body even roomier but otherwise I wouldn’t change a thing. 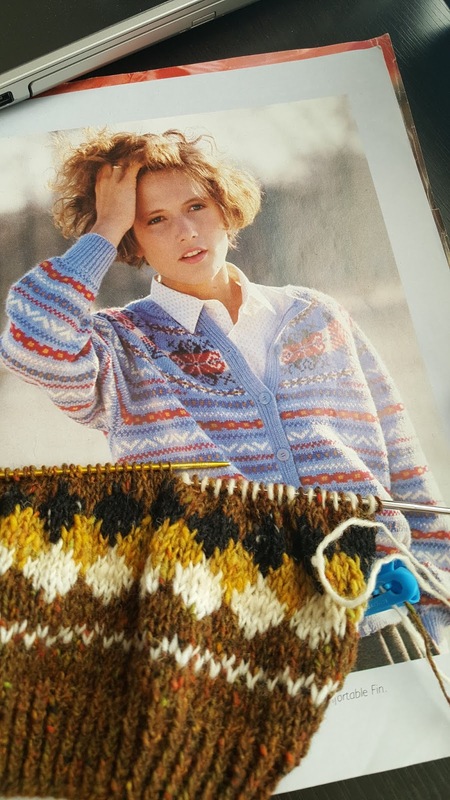 The most difficult part was the choice of the color work motif for the bottom of the cardigan. There are so many possibilities in books, magazines, and online, that I could easily get stuck on this particular step forever, making swatch after swatch and agonizing about my decision. It’s a well-known fact that too many choices are bad for our brain, they make it freeze and as a result we leave dazzled and confused without making any choice at all. That is why I narrowed my choices from the get-go: I was looking for a traditional Scandinavian pattern but without flowers or snowflakes, geometrical, with only three colors in the palette (at first I tried to broaden my color scheme and introduce some other yarns but later decided against it), and not too wide. I gave myself a couple of days just to swatch and look at as many magazines and books as possible. 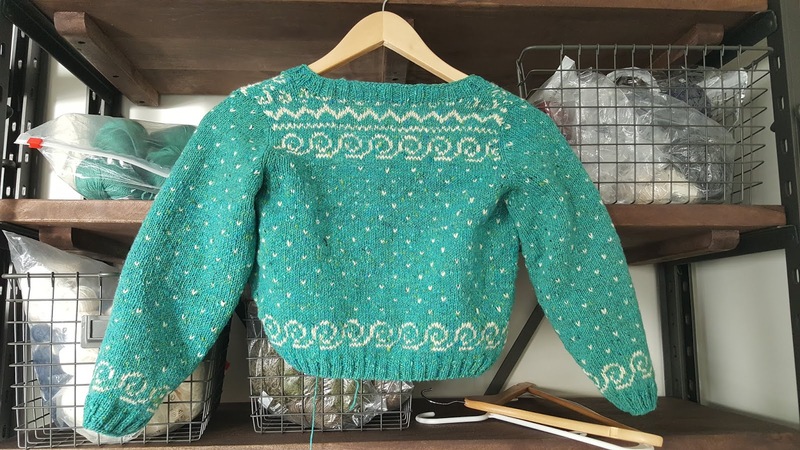 Yet, when I finally decided on a pattern and started working, somehow my judgment changed and I modified it the way I thought worked better for the whole garment. Does it happen to you? It happens to me quite often. On a photo or even in a swatch yarn and colors look differently from when you start working on the whole project. Plus it is easier to visualize the finished garment and how it would fit (or not). Fortunately, in this particular case the changes were minimal and I happily finished the whole thing quickly. I made sleeves flat, as usual, because I don’t like sleeves knit in the round (and they are much faster to make this way). My main regret is the yarn. It is extremely soft and fuzzy, and will pill in no time. Like really pill, the way only an extremely soft yarn does. So this jacket is bound to have a short life. No worries, I’ll make another one later from a good yarn. Next I finished Splashy, the yoked sweater I wrote about in my previous post. 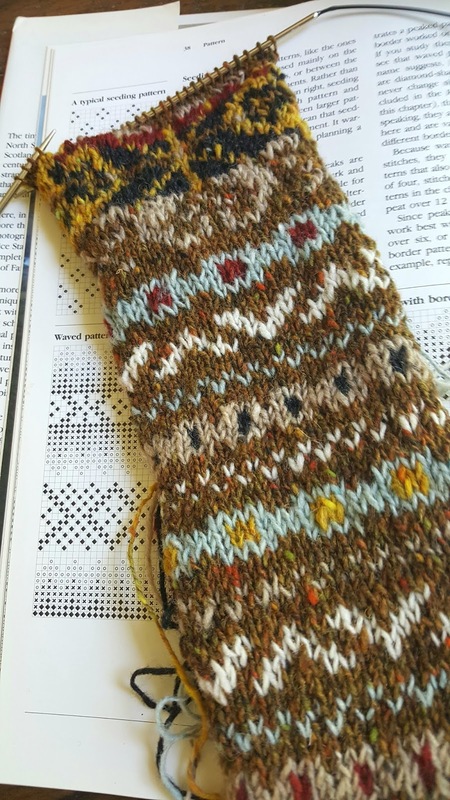 My older daughter asked me for a pair of new socks to replace the old one and the socks had to be made before our trip to Scotland in August. As I’ve already explained, I hate making socks. My major problem with them is there are two socks and they have to be identical. Yet, when I finish the first one, I usually discover how it could have been made better, but the second one must be done without any changes. This is really annoying and frustrating for my inner perfectionist. However, as I learned, perfectionism is a disease and needs to be squashed in the bud. If I try to knit a perfect garment, I’ll never finish it. 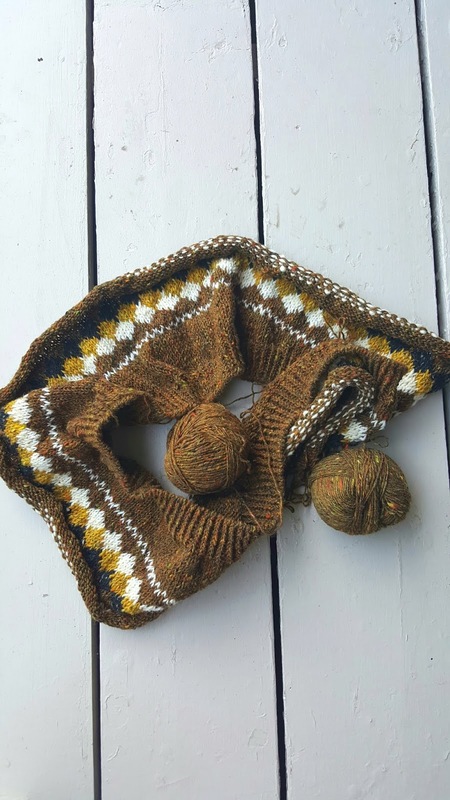 Imperfections are an integral attribute of knitting, of any handmade. Because we humans are not machines, we are bound to make mistakes and live with them. 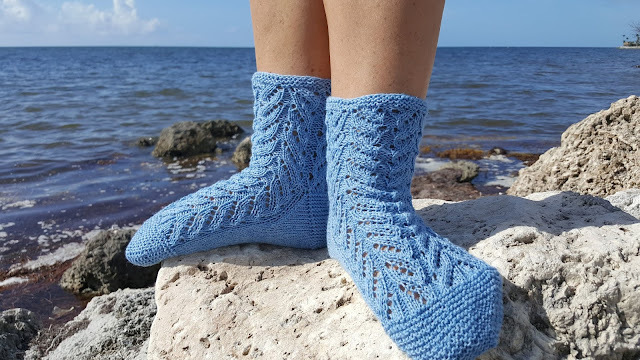 I used the same pattern by Veronik Avery as a couple of years ago since my daughter liked a lot the previous iteration of the Lacy Cable socks but this time I made them with Colormart cashmere scraps in bright blue. It is a very summery color and hopefully will remind her of vacations in Florida. 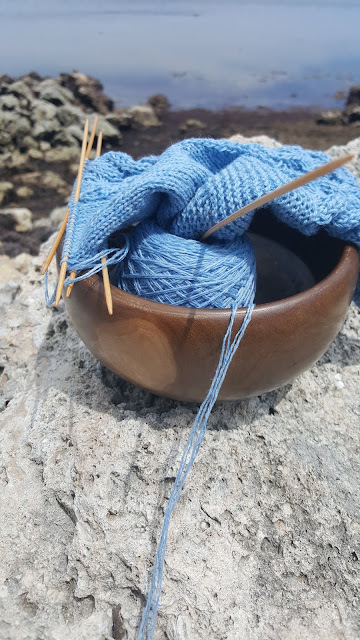 Somehow everything is better by the ocean, even sock knitting. As soon as I finished this pair, my hands were itching to start another one. After all, I’ve got two daughters… But I’ve already made other plans (see here). 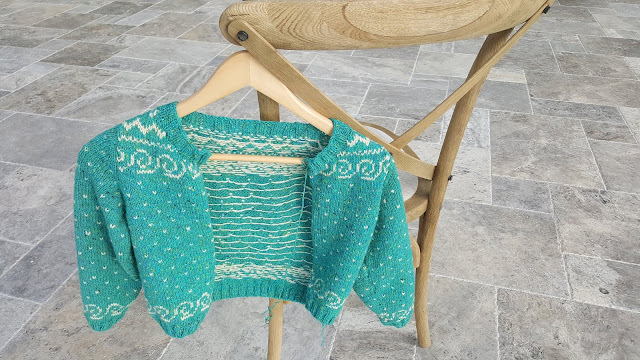 Socks done, I started working on another gift – a cardigan for a 10 year old girl with Rowan Fine Tweed in the colorway Monsal Dale (also very bright, reminds me of the ocean) with motifs in Bell Busk. 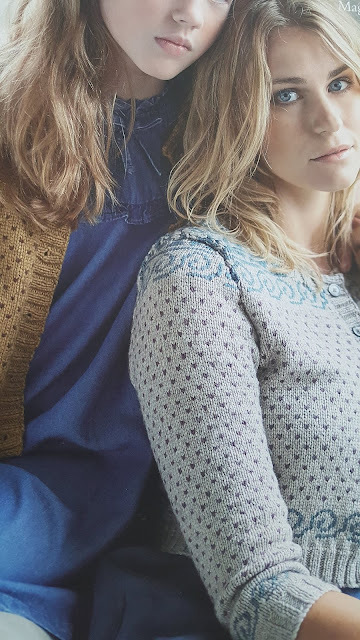 I picked a Martin Storey’s pattern from Rowan magazine 61 – Periwinkle Family. This cardigan is short and has three quarter sleeves since it is supposed to be worn in summer. Yet, I was knitting a winter cardigan, so I made it longer with long sleeves and slightly modified fairisle pattern. Plus I changed the sleeve cap completely. Look at the picture of this cardigan (it is right on the magazine cover). I didn’t like how the sleeve cap puckers and made it fit into the armhole better (well, at least I prefer how it looks now). The cardigan was almost finished before our leaving Florida, yet, it didn’t happen. Some things came up plus I didn’t like the neckband the way it is described in the pattern (and I made it following pattern directions) but there was no time to unravel it and make it again. So the unfinished cardigan was left in Florida waiting for my return in October. According to my plan, my next project was again a round yoke. This cardigan from an old French magazine had been in my plans for ages. 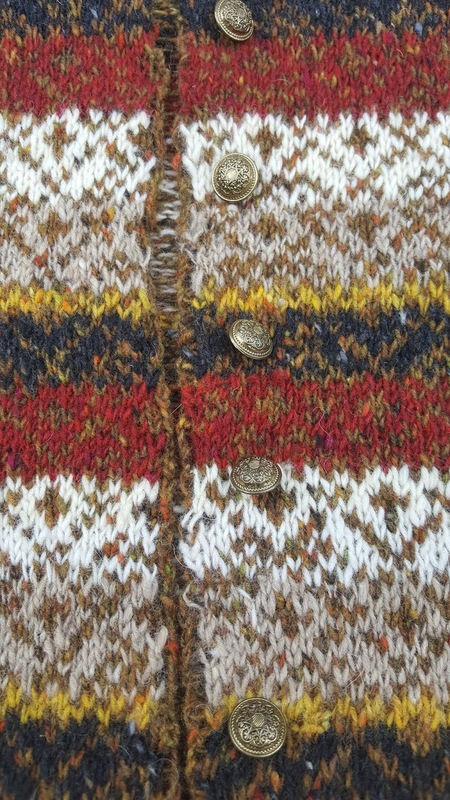 I naively believed that the remnants of Rowan Fine Tweed were the right choice for this project. Yet, as Robert Burns wisely told us, the best-laid plans of mice and men often go awry. 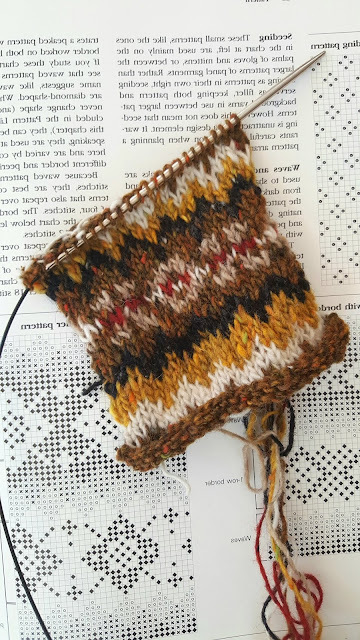 When I started swatching the results look unattractive to say the least and the yarn colors, tweedy and uneven as they are, didn’t mix well. Funny, how sometimes the balls look really good together but when you start knitting with them they just don’t work. I made several attempts to conquer the yarn in two days that we had before leaving for Canada. Still not sure about my final pattern, I just put all the balls of Rowan fine tweed in a back pack and took them with me on the two week trip. It was the only yarn that I had with me and I must confess that it was a deliberate decision. Sometimes, when a yarn doesn’t want to cooperate, I just abandon it and start working with different yarns and projects. This time I really wanted to get rid of as much of this yarn as possible and having no other choice made me finally pick a pattern and knit something from most of it. It wasn’t an easy decision. It had to be a cardigan because of these buttons. 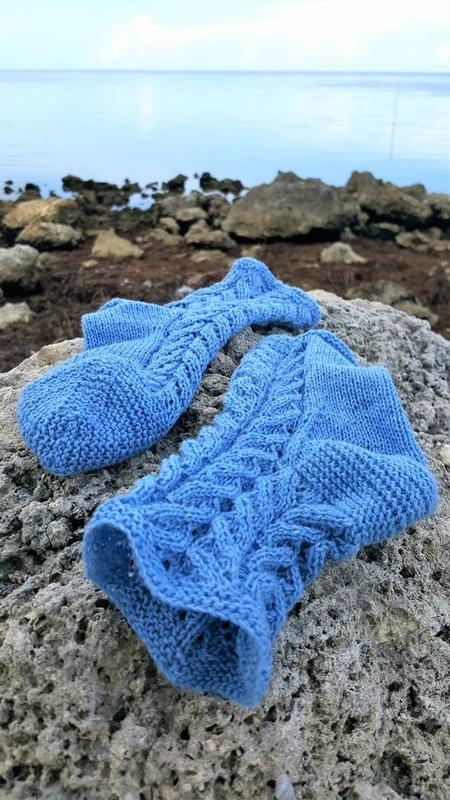 I thought they would go really well with the yarn and was looking forward to finally use them. I decided to follow the pattern and make it from the bottom. This way the area around shoulders won’t be too big because I could incorporate raglan decreases and get a better fit. The yoke fairisle motifs, being a little old fashioned and well recognizable, looked well knitted in my yarns, but the bottom part didn’t. At some point I totally abandoned the idea of regular fairisle stripes all over the body and thought that one large stripe at the bottom and on sleeves would be more than enough. However, none of the patterns that I tried would work with the yoke motifs. 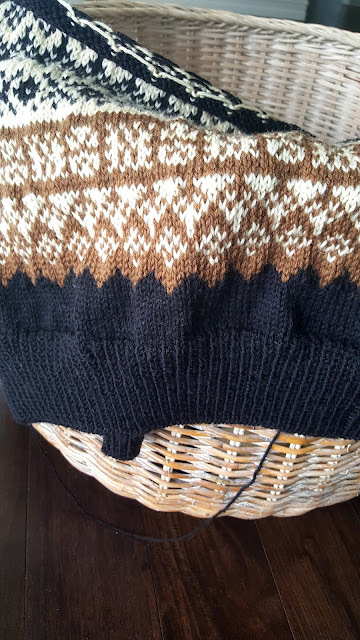 I kept telling myself that I could always change the yoke when I got there and recalculate all the numbers for another fairisle pattern but deep down I knew that it wouldn’t be possible. You see, I had precious little time to knit in Canada with all the moving and theater going. I wasted a week already on a cardigan that most likely would never be finished and worn. At some point I just decided to bite the bullet and unravel the whole thing to start something totally different. Now, I feel that I need to explain why I wasn’t happy with my swatches. I don’t know much about color theories and I certainly never had a class or even read a book about it. Yet, colors are an essential part of my life. I react to them on a physiological level, cannot do anything about it. It is an instinct (a color instinct), an inner ability I was born with that I learned to trust. So I cannot talk myself into liking a color combination or a color because of some very sound and logical reasons. If something doesn’t work for me, it just doesn’t, and I cannot make it work. Again I found the pattern for this color work online. I don’t know its origin, and didn’t look for it because… I don’t think that anyone would ever make it. I for sure wouldn’t if I were you! It is what is called in the ads “Do not attempt at home”. The pattern is not particularly complicated (only 8 rows, easy to remember) but dull, repetitive, with a lot of color changes. It requires your total attention, no TV or talking. Surprisingly enough, what helped my work was the book I was listening to at the time. It was Something in the Water by Catherine Steadman and it was irritatingly bad (stay away from it, it is really awful!). Why didn’t I abandon it? Because it was for a book club and, after a while, I really wanted to finish it to be able to write an honest review and tear it to pieces (well, figuratively). Between the book and the color work pattern, the pattern looked much more attractive. The progress was painstakingly slow. 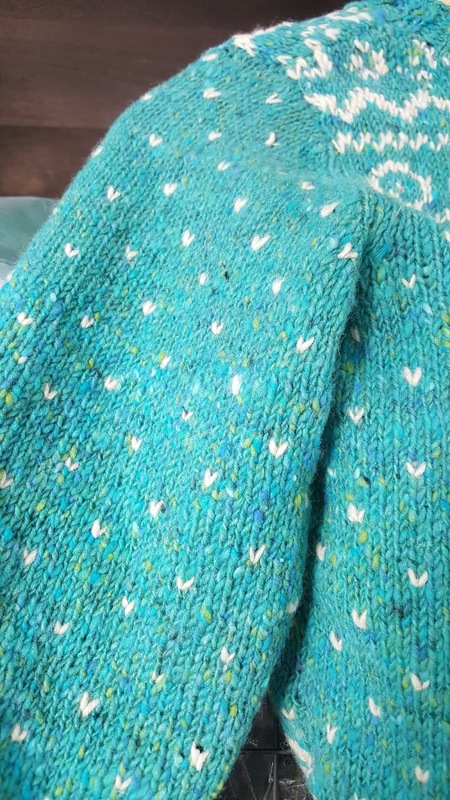 Nevertheless, I loved how this yarn looked in this pattern. It felt like a good match, so it didn’t matter that I had to endure the monotony and the boredom of making it for the end result’s sake. And I did it! 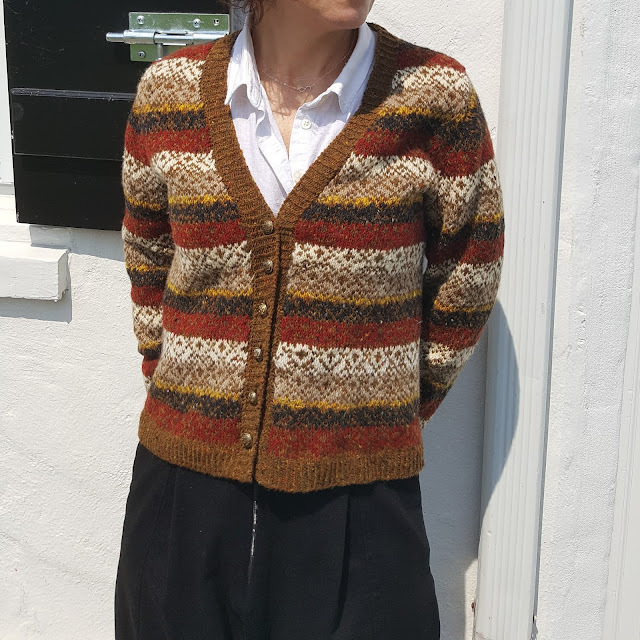 Look at the finished cardigan. I used the same basic recipe as for my Asbury, but made it shorter and without pockets. I am especially proud that the stripes on the sleeves match with the stripes on the body. That wasn’t easy, and this is why I had to make sleeves a bit longer than needed. But I decided that sometimes long sleeves can be useful, plus I am not sure who will eventually wear it, so the new owner probably won’t have any problem with the sleeves at all. So much for all my careful planning! Thanks for writing about the processes of your knitting. I admire you for simply remembering all that went into the projects. I'm guessing you write yourself notes. 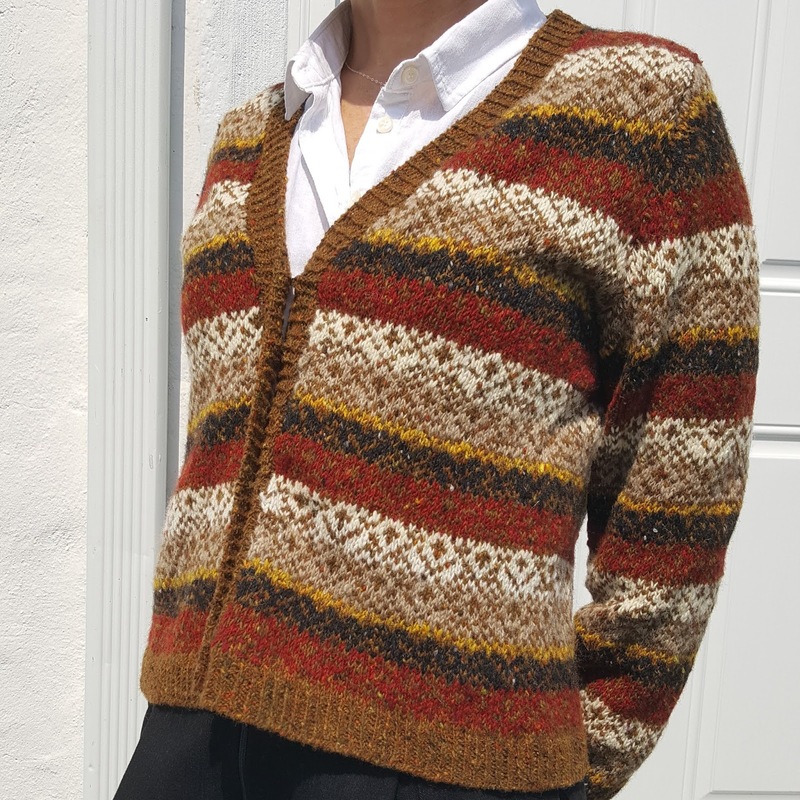 Again, I love the colorwork cardigan. As an absolute beginner knitter, I am in awe of all the things you make! They are beautiful. One day I hope to move beyond the simple and learn how to knit colourwork. In the meantime, I will crochet on autopilot whilst talking or watching TV - so needed at the end of the day! Thank you, Jen! You are too kind. And you are right - we all need some mindless knitting at the end of the day. Actually, everything is better while knitting, or at least it seems better, don't you aree? Good luck and happy knitting!